Over the past few weeks, yields on U.S.10-year Treasury notes (TNX) declined further following the Federal Reverses suggestion of their intention to perform a new round of quantitative easing. The reasons for the Fed’s decision to intervene were: excessively low levels of inflation and inflation expectations combined with a stubbornly high rate of unemployment at this stage of the economic recovery. Interestingly, the yield on U.S. Treasury notes (TXN) tested an important resistance level at 2.33% before backing away amid a set of disappointing quarterly refunding auctions. At the end of the week, the 10-year Treasury note yield reversed almost 25 basis points higher which forced investors to rethink their current demand for fixed income securities. Speculation over the size of the quantitative easing was not clarified by Fed Chairman Ben Bernanke’s Friday morning speech in Boston. Additionally, new concerns arose later in the day when the Treasury Department delayed the release of its semi-annual Currency Report. This document was widely expected to suggest that the Chinese government was going to be called a currency manipulator. Some opined that the expected release of this report caused China to greatly reduce their demand for US treasury instruments, perhaps in a show of contempt. In any event, the yield on 10-year notes halted its decline at the 2.33% level with deeply oversold conditions present in terms of yield (overbought in terms of price) on long-term monthly charts. Perhaps this event signaled the beginning of a pause in a declining rate environment, particularly with the mid-term elections only two weeks away. Perhaps it was the beginning of a correction that could last a few months or so. That said, if a move to lower yields were to regain momentum, a solid break below the 2.33% level could lead to an eventual drop down to the 1.65% area, which in turn would suggest that the amount of quantitative easing might be on a grander scale than currently anticipated. 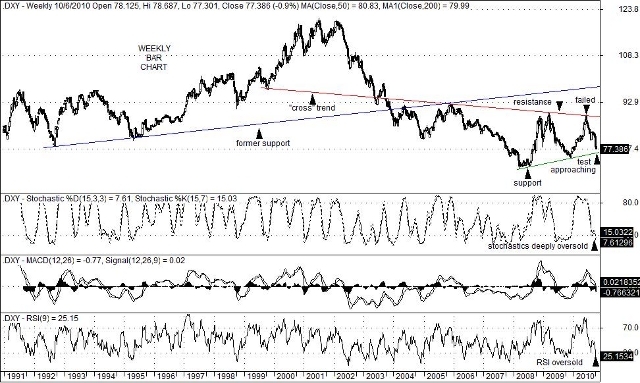 With deeply oversold conditions present on weekly charts, the U.S. Dollar Index (DXY) is now approaching a test of key trend line support at the 76.20 level. Although this trend line only dates back to the low of 70.70 set on March 20, 2008, it has held up as support on each attempt to break below it since then. One of the reasons for the dollar’s recent drop is the near ubiquitous expectation for a second round of quantitative easing. This expectation is due in part to the Fed’s desire for a bit more inflation, which may have already been discounted by investors. At the very least, commodity prices have risen briskly over the past year, with an acceleration of it following the release of the Federal Reserve latest “minutes” report. In addition, yields on U.S. Treasuries have since declined to fresh lows, and in some cases to new all-time lows. A big worry is that a large percentage of investors are now betting in the same direction. Of course, the Fed’s recent “minutes” report appeared to have given the markets what amounts to be a free “put” on current downside “risk”. In addition, that “put” appeared to have gained more importance after the release of Friday’s employment report. In particular, the “U6” rate, the number that measures the unemployed, the underemployed and the discouraged who have abandoned looking for a job , jumped from 16.7% to 17.1% matching its May reading, but slightly below last October’s cyclical high of 17.4%. Nevertheless, the 17.1% number was mildly startling, as was the revelation that 41.7% of the official unemployed have been so for 27 weeks or longer. In any event, a test of the 76.20 level may soon occur. 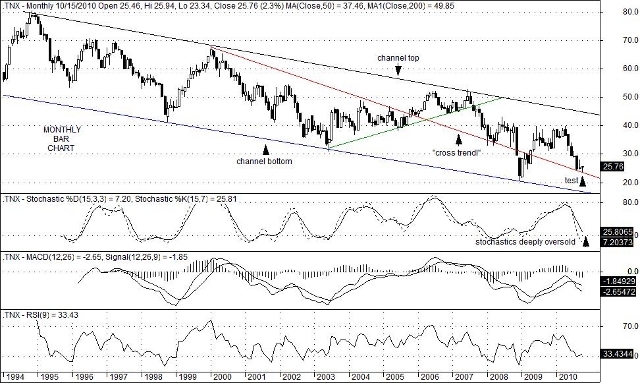 If it holds as support and reverses higher, both commodity and equity prices could tumble. So could bond prices. A solid break below 76.20, on the other hand, would likely extend the current trends higher in equity, commodity and bond prices as the “devaluing of the dollar” process moves into a new “leg” lower. You are currently browsing the Charted Territories blog archives for October, 2010.